Chart prepared by the author from OECD data. See End Note 3. Despite the lingering blue collar image of the union movement, women unionists now outnumber their male colleagues for the first time in raw numbers: 800,800 to 746,400, and are now two and a half percentage points more likely to be union members as a proportion of the workforce than are males. Remarkably, professional employees are the ABS occupational group now most likely to be union members at just under 20%, though they are followed closely by machine operators (17.7%). Community service workers are next at 16.4%. Reflecting these changing demographic trends, both the senior officers of the ACTU today are women who have backgrounds in professional health and social services industries: President Ged Kearney comes from the Nurses Federation and new Secretary Sally McManus was previously Secretary of the NSW Services Branch of the Australian Services Union a union with growing membership among social and community services sector employees. 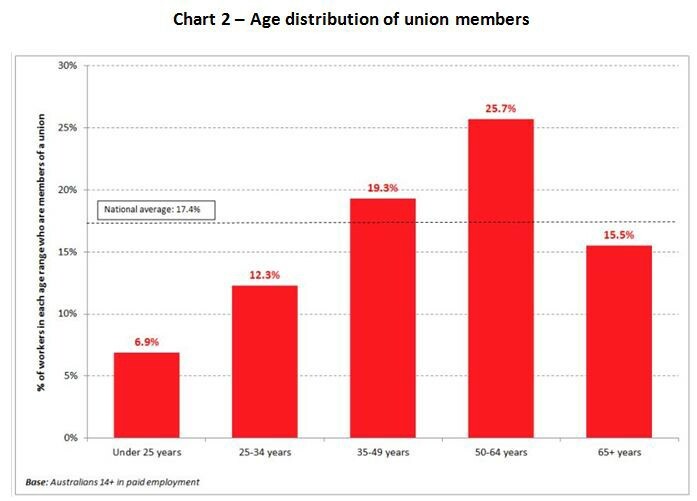 Of concern for the union movement is the age of union members. Unless older, aging union members are replaced, the decline in unionisation rates will accelerate. The good news for the union movement is that there is still a strong wage premium benefit in being a union member. The union wage premium for females is about twenty per cent; for males, 13 per cent. Why has the rate of unionisation declined? Unionism grew in the first half of the 20th century because there were strong structural supports and encouragements which fostered the growth of representative organisations of employees [and employers]. Compulsory arbitration of disputes and award making allowed unions to demonstrate to workers their ability to take effective action to establish decent wages and working conditions. Unionism was the mechanism by which the voice of workers was heard in industrial tribunals. The extension of preference clauses to key clerical awards in the 1970s was responsible for the boost in union membership amongst white collar workers. Some employers were willing to enter into ‘point of engagement’ union membership agreements with unions to avoid preference clauses. As ‘recently’ as 1970 the McMahon Liberal Government was willing to introduce payroll deduction facilities for federal public servants which, along with the pro-union stance of the subsequent Whitlam Labor government, encouraged the growth of public sector unionism. The trade union movement considered the Fraser Government to be hostile to unionism but in retrospect it appears to have been more than benign. The union movement appeared to reach the height of its powers during the Hawke/Keating Governments of 1983–1996 — the period of the Prices and Incomes Accord. However, the decline in union density also began in this period. During the Accord period the ACTU sought to strengthen unionism through amalgamations and by the process of union ‘rationalisation’. This did not arrest the decline in union density. This time also saw the introduction of enterprise bargaining, initially opposed but later supported by unions. Many unions saw enterprise bargaining as an organising and recruitment opportunity and a means to demonstrate the power of collective action. During the 1980s, the national consensus supporting unionism and arbitration as a ‘public good’ began to break down. Employers went on the offensive, seeking to de-unionise not only white-collar areas of employment but also union heartland areas such as mining. The names Dollar Sweets, Mudginberri ,the SEQUEB dispute and CRA/Robe River reflect only the most prominent attempts by employers to attack and defeat unionism. taking the timing of annual national wage claims out of the hands of both the ACTU as applicant and even out of the hands of the Industrial Relations Commission. The limited forms of ‘preference to unionists’ available were removed by the Workplace Relations Act 1996. Freedom of Association (FOA) has been enshrined in legislation but equally so has a freedom of ‘non association’. FOA, which was originally designed by the International Labor Organisation to support unionism, is today in the Australian context almost as equally used as a weapon against unionism and in support of the rights of non-unionists. Unionists were left with the feeling that the incoming ALP government did not want to be seen to be close to the union movement. In his election campaign in 2008, Barak Obama declared “I believe in unions”  but nothing of the sort was heard from Kevin Rudd before or after he was elected. Throughout this whole period the rate of unionisation has continued to decline. Measures adopted by the union movement such as Organising Works — an attempt to create a new cohort of young unionists adept in organising — and a range of organising efforts in sectors of the ‘new economy’ have failed to reverse this declining trend. However, over the past two years or so, Australia has been rocked by a series of public wage scandals affecting employees in a range of industry sectors. A question often debated in the 1970s was “do unions have too much power?”. Now the question could hardly be asked in a workplace setting. The wage scandals in fast food, retail, agriculture and elsewhere point only to one thing: not only do unions have limited power, without unions employees increasingly have none. When vulnerable immigrant workers are forced to lie about their hours of work or hand back in cash part of their earnings there is a serious problem in this country. Wage growth is at record lows in Australia and in other developed economies. This is increasingly being blamed for declining household incomes, dragging down taxation revenue to the government, increasing income inequality and even poor investment returns. Following a boom in enterprise agreement making in the initial years of the Fair Work Act, the number of agreements being made is in significant decline. Many employees are languishing under ‘zombie’ agreements; that is agreements which have passed their nominal expiry dates but which have not been replaced and are no longer delivering wage rises. The benefits of enterprise bargaining now appear to have been exhausted. There seems little incentive to bargain further and as 90% of private sector workers are non-union, unions have no power to press a bargaining campaign. Concentrating solely on the rights of individuals rather than on the power of the collective provides little real benefit for workers as a whole. Individuals may assert their existing rights (won by others) but are unable to improve standards overall. The successful outcome was a positive benefit to the employees, and to the sector itself and therefore its clients and society as a whole. The application was supported by key employers in the sector [other employer organisations were wary of the flow-on effects] and by the Federal and Labor State governments. Unorganised workers could not have run this case. Non unionists contributed nothing to it. There is no ‘public good’ to be found in non-unionism. In recent years, unions have tried to arrest the decline in unionisation. Financial scandals in some unions such of the HSUA, the NUW and others have not helped the image of the union movement, nor has some of the agreement making practices uncovered by the Royal Commission. Union officials must always carry out their duties in trust for and only in the best interests of their members. Even without the existence of scandal, unionism has been declining in significance. It may no longer be within the power of the trade union movement alone to reverse this trend. This is now a matter in which society as a whole must play a role, both in the national interest and in the interests of working people. The economy is not hindered by a strong union movement. Vibrant, democratic and active unions can help drive better and more productive workplaces through decent work and high productivity and performance. The race to the bottom in wages and conditions is not serving Australia well. Cheap pizzas based on the exploitation of vulnerable workers are not necessary. Unionism is not a selfish act, but a selfless one. It was long recognised as a public good and a social utility to be encouraged. It still should be. The Fair Work Act needs to be amended to re-introduce as an objective the encouragement of an active and involved workforce and representative bodies of workers. Freedom of association should operate so as to encourage the right to form and join unions and to bargain rather than treating free-riding as an equally desirable outcome. The role of arbitration of all award and workplace disputes must be re-established. To create the political space in which such actions can be taken, politicians of all parties need to recognise the value of unionism to Australia and to speak up to support this value. Employers and employer organisations need to work co-operatively with their employees and their representatives to create decent workplaces with decent wages and working conditions. A low wage, low productivity economy serves no one in the long run. ABS, Characteristics of Employment, Australia, August 2016, Table 16.1, Employees and Owner Managers of Incorporated Enterprises in Main Job. 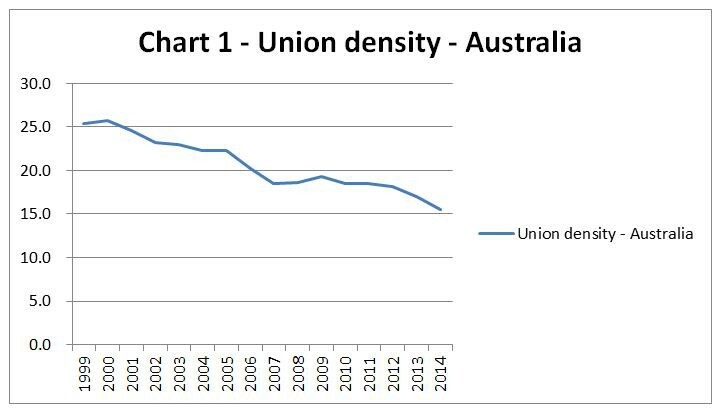 The ABS also has another measure of union density which includes all ‘Employed Persons’. This data set includes owners of unincorporated enterprises. By this measure, union density is 13.2%. ABS, op.cit., Table 18.1. Note that these are all Employed persons figures, the only sector breakdown available in the most recent release of data. CONCILIATION AND ARBITRATION ACT 1904–1973 — SECT. 47.